What with the weather being pretty damn dismal this past week, we’ve been on the look out for some hearty meals to warm our cockles; salads and BBQs at ease! 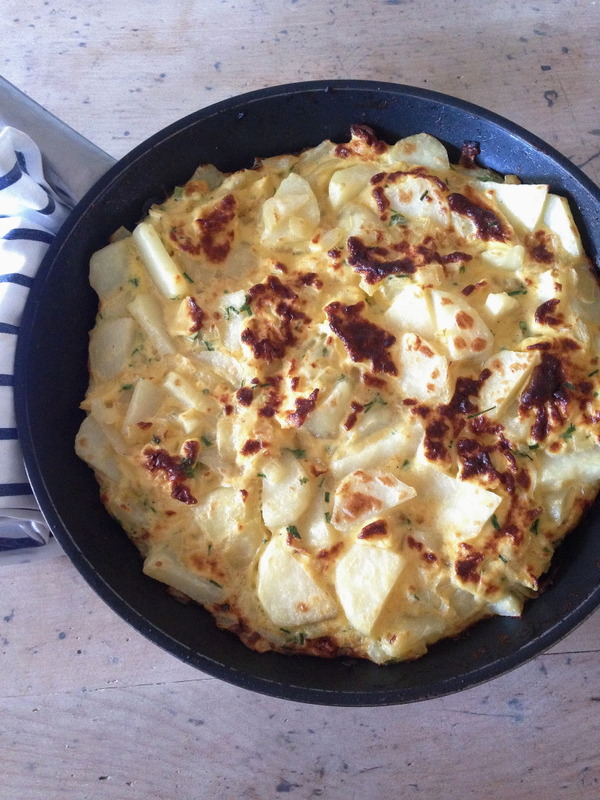 For this recipe I’ve stripped my normal colourful tortilla right back to my Spanish tortilla basics: eggs, potatoes and onions – the reason being – I figure if you get the hang of getting the flavour and the cooking of this tortilla just right then you’re flying and you can start having fun with it. Ditch the spuds for broccoli, peas, chunks of wild salmon and fresh dill!! 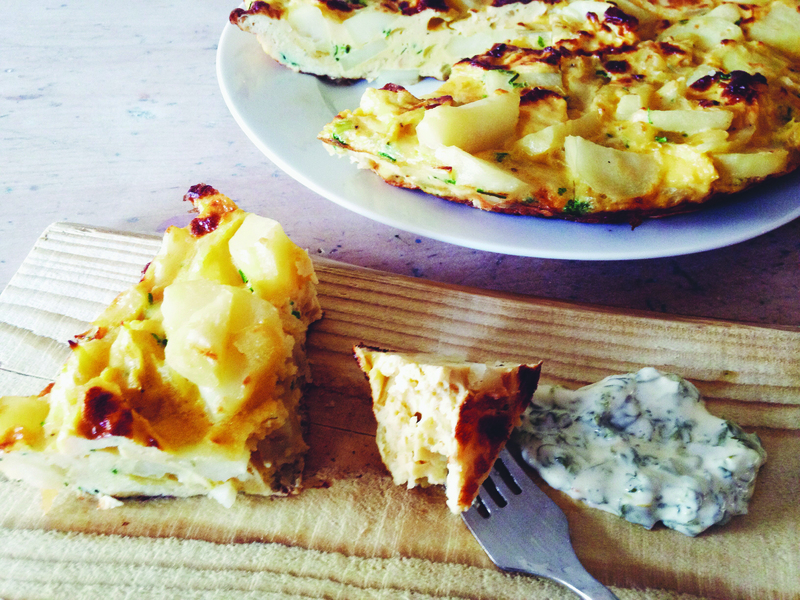 Oh yes, this humble tortilla can easily be tarted up to a fancy ‘fritattattaattataaa’ with a dash of your imagination! This recipe is home grown and has evolved over years of making it. I’m convinced the secret to making a really tasty tortilla is in the salty, slightly sweet onion/garlic mix, which, combined with getting the cooking technique nailed gives you a great base for whatever ingredients you throw at it… a handy little recipe to have under your belt! – Peel then chop your spuds in half and then cut them into slices. Pop in a pan and boil until cooked but still firm, nothing worse than ‘fudgy’ potatoes. – Add 100ml of water, 1 tbsp of marigold bouillon and 2 tbsp of honey to the onion mix and simmer for a further 3 minutes until the onions are soft and transparent. 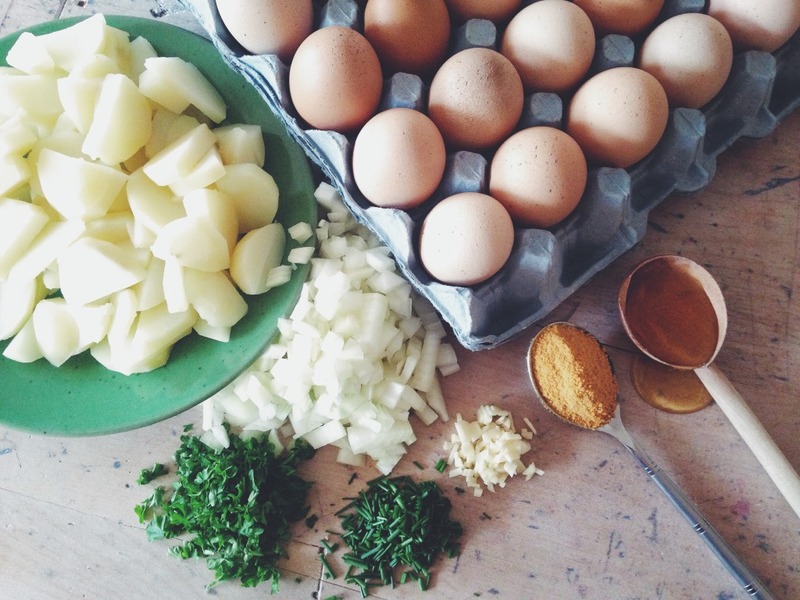 – While the onions are cooking, whisk up your eggs with the finely chopped fresh chives and parsley (you can decide how herby you would like it) add a few grinds of black pepper, you won’t need to add salt to the eggs as the bouillon in the onions is enough seasoning; put eggs to one side. – Add potatoes to the pan and really coat them in the onion mix. – Turn your grill up to about three quarters ( I’m guessing that’s to number 4\5 on most cookers) and arrange the shelf so the pan can sit about 10cm below the grill. – Now this is the tricky part. 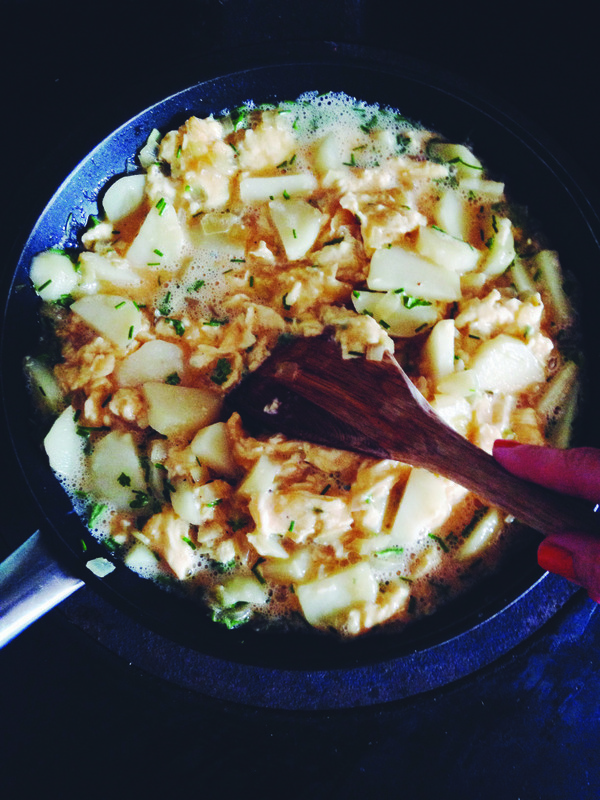 Pour your eggs into the pan with the onions and the spuds, give it a moment to start bubbling, being carful not to let the bottom burn and start to fold the eggs and potatoes, a bit like you would do if you were making scrambled eggs. Now the trick is to keep moving the eggs around until they are nearly all cooked and then flatten down the potatoes a little on the top, let the bottom cook for a small minute and then pop the pan under the grill so the top half of the tortilla gets a chance to cook and turn golden. You’ll get this down to a fine art – the hob grill combo works really well, just keep the heat to a medium temperature, the last thing you want is a crispy top and bottom with a raw middle. In the worst case scenario you can always put the whole pan in the oven at 170 to finish off, but this really shouldn’t be necessary. 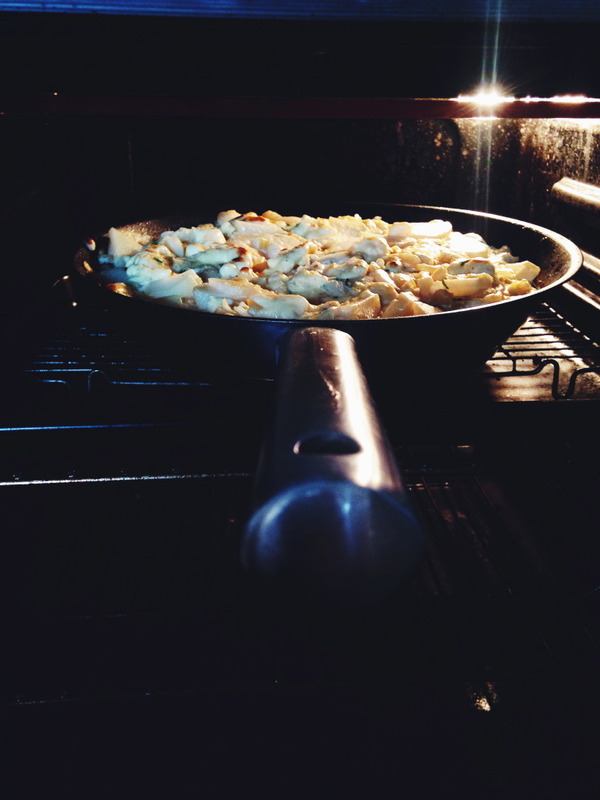 – Now give your pan a shake to loosen the tortilla, place a plate on top of it and turn it out. – Serve hot or cold, I highly recommend eating it with a dollop of mayo mixed with fresh herbs. Keep the tortilla in the fridge and take to work for lunch! Have fun with it – I would love to hear about your creations.